For Vivago, responsibility means accountability over people, the environment and the economy. Vivago acts responsibly and in compliance with legislation and generally approved policies. Sustainable development is an important issue and the goal is to include it in every part of production. Vivago's subcontractors have been meticulously selected and are required to act in a responsible and ethical manner. The entire value chain of Vivago is Finnish. The products are manufactured in Finland and their recycling has been taken into account in their design. 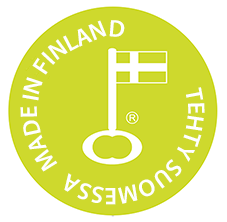 The products have the Key Flag mark granted by the Association for Finnish Work. For Vivago, responsibility also means doing what is best for the customers. It is essential for Vivago to maintain open communications and dialogue with its customers. The goal is to continuously improve the operating models of the company and meet the customers' needs. Vivago is certified in accordance with the ISO 9001:2008 and ISO 13485:2003 quality systems. In 2012, Vivago initiated operations and evaluations in accordance with the instructions of the ISO 26000 standard. Vivago is owned by more than 100 Finnish institutions and private investors.